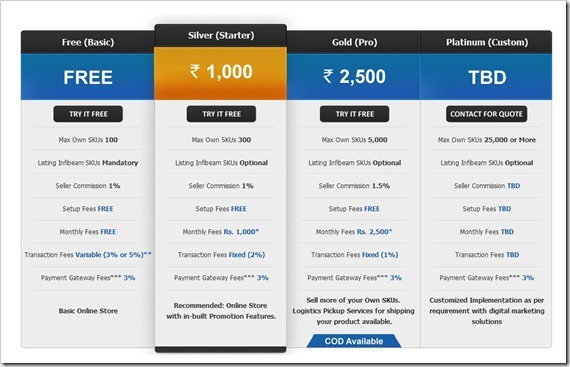 Infibeam’s Buildabazaar.com – Enabling everyone to open an Online store! 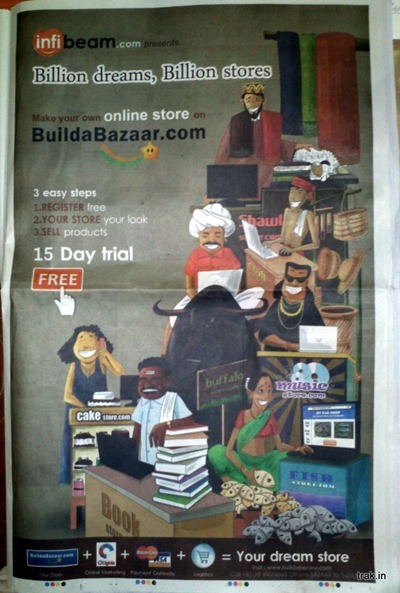 Buildabazaar.com was launched by Infibeam last year and can be termed as a readymade ecommerce framework which can enable any small or medium sized business to create an online store. Although, the concept is not new, I think the timing of this ad and Buildabazaar’s marketing of the platform is perfect. It is a time when many small & medium sized businesses in India want to come online. Everyone has woken up to the fact that online commerce is going to be huge going forward in India. There are number of similar platforms who offer such services in India, the biggest platform being Martjack.com. However, infibeam’s Buildbazaar.com brings additional advantages to the stores on their platform because it is tightly integrated with infibeam.com itself. Once the user registers and creates a store on Buildabazaar.com – Infibeam will promote products from user stores on their platform and also allow the user to sell Infibeam products on their online store. For a business it is a win-win situation where they are benefitted from Infibeam’s traffic & Infrastructure as well. Buildabazaar.com’s pricing structure looks quite competitive as well – For very small businesses who have less than 100 products, can actually get the store online completely free. Their Gold account costs Rs. 2500 and allow upto 5000 products. Give it a spin – let us know what you think..
"Infibeam’s Buildabazaar.com – Enabling everyone to open an Online store! ", 5 out of 5 based on 1 ratings. How are Indian companies making their annual reports innovative? I think there are a lot more providers of “eCommerce out of a box” in India now – including ourselves . Would be great if you made a more detailed writeup comparing all these solutions. We would be more than interested in participating. You may want to check out http://www.zepo.in. They have great features, good pricing, and offer the free payment gateway setup. Mart2web is the good ecommerce software solutions. Pricing is very high , people will prefer ebay instead.